when buying this product. Which combined with your current cart contents can be converted to into a voucher of £0.14 to be used on future orders. 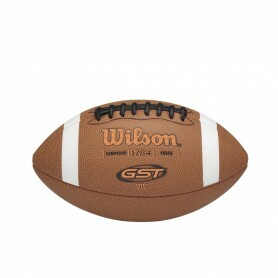 This official game ball features GST™ (Game Saving Technology), Wilson 899 WE leather with tanned-in tack. 1003 small pattern is easier to grip and throw, padded cover offers soft feel and better grip. ACL™ Lacing System provides better grip and control. Wilson exclusive Grip Stripes, lockstitch construction. NCAA approved and stamped. On an onside kick, it just takes one extra bounce, one extra yard, to give your team a chance. The right adjustments can make all the difference. Make the changes you need with our Adjustable Kicking Tee and come through in the clutch. Adjustable round kicking tee can be adjusted from 1” to 2” by twisting. Design is ideal for directional and on-side kicking. 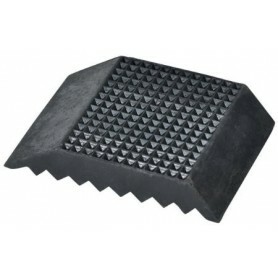 Made from durable Hardened Rubber. The Wilson Duke Metallic Edition decorates a classic with a stunning gold finish. Every kick, every play, every touchdown in the NFL has been with Wilson. Practice like your sports heroes with the Duke Metallic Edition. Features a high-performance composite to match the original’s feel and excellence. 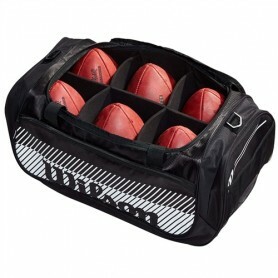 Toss it on the bus, drag it through mud to the sidelines, this fleece-lined football bag is built to last and water resistant, so you can trust each game ball will be ready for kick-off. The future of the game – introducing the Wilson GST Prime. Engineered by players for players, the Wilson GST Prime equips the world’s #1 selling game ball with additional grip points, high visibility accents, and a built-in prep gauge. The most innovative technology to upheave the game - the ultimate weapon when the extra yard matters most. 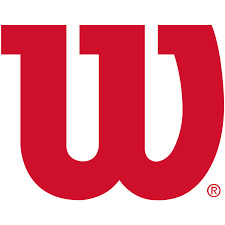 Throughout American sports history, no other brand has been partnered with a league longer than Wilson has been with the NFL. Not only has every point scored in the NFL been with a Wilson Football, but every Wilson NFL game ball has been handcrafted in Ada, OH by skilled craftsmen and women for decades. "The Duke" NFL football was named in honor of the game's pioneering legend and NY Giants owner, Wellington Mara. Back when Mara was a young boy taking in the game from the sidelines, the Giants players dubbed him "The Duke" and years later, the NFL game ball took on this nickname too. Bring home "The Duke" today, which is as close as a fan can get to the authentic, on-field icon that's been passed, caught and carried by the game's greatest since the NFL started in 1941. No-huddle, quick hitting offenses are in. And that means there no time to find the laces before you have to find your receiver. Used by the NFL, NCAA and high school teams, The Wilson Laceless Training Football helps quicken your release by preventing you from relying on laces to make pinpoint passes. Make yourself into a better quarterback for the modern game. 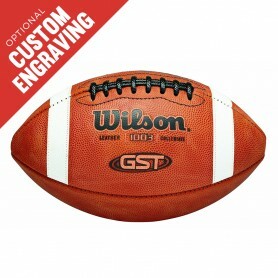 The Wilson GST practice football is successfully used by 180 NCAA programs and countless high school programs as an affordable high quality practice football. 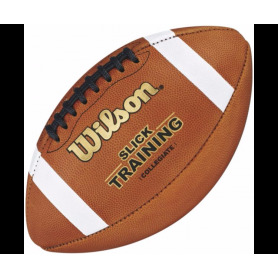 The GST practice football offers programs an opportunity to use the same style football their quarterback will be using in a game, in practice without scuffing up the gameday ball. Featuring patented sewn on stripes and ACL composite leather laces combined with exclusive Wilson GST leather. 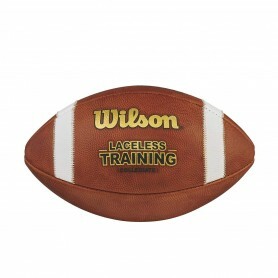 Simulate gameday and prepare your team for success with the Wilson GST Practice Football. Never before has the game of football seen anything like the Passback™, the World's only football that rebounds and spirals back to the passer. Not only is the Passback™ amazing, it is simply the best tool for training, practice or play. The Passback™ is the only football you can throw and catch by yourself. No strings attached. Great fun or serious training Quarterbacks use the Passback™ to strengthen their throwing muscles and improve accuracy. The Passback™ gives receivers more than 20 repetitions per minute. Wilson composite footballs feature a premium composite leather cover with high defenition pebble for superior grip. Patented ACL (Accurate Control Lacing(TM)) laces are made of pebbled composite leather which provides 174% more grip than traditional laces. 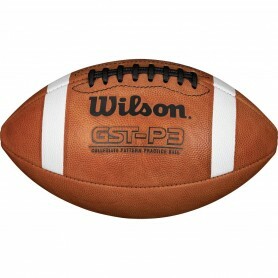 The stripes on the football are Wilson Grip Stripes and provide improved grip over traditional painted stripes. 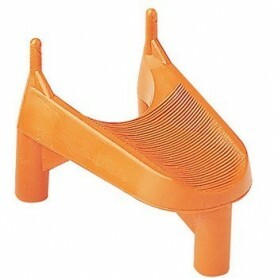 A multi-layered linig offers better shape and durability and the butyl rubber bladder provides maximum air retention. Designed for fans and collectors of all ages, the Wilson® NFL® Autograph Official Football offers three smooth white panels for your favorite athlete to sign. Start your autograph collection today and capture all your teammates and favorite athletes with the trusted Wilson® NFL® Autograph Football. Premium Composite leather. Patented ACL lacing. System tackified surface. Designed for recreational play. 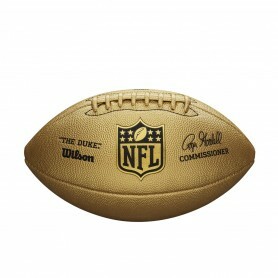 "The Duke", named in honor of football legend Wellington "Duke" Mara, is the official game ball of the NFL. 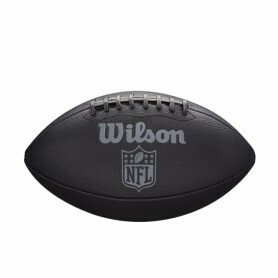 Wilson has been the official game ball of the NFL ince 1941. Hand crafted in Ada, Ohio "The Duke" has an exclusive pattern to the NFL using hand picked Wilson Leather and double laces for added texture and control. Every NFL Game Ball sold in stores is inspected by hand and must pass the same specifications as those used on the field every fall. The TDY GST Youth ball uses patented ACL Laces, exclusive Wilson patterns and a durable composite leather cover combine to offer a more affordable alternative to our famous GST series of game footballs. Combining the same Wilson TD family of patterns with composite leather technology and patented ACL laces, the GST composite family is a great option for feel and control for practice, developing players, or inclement weather games. Leather cover with tanned-in tack and deep pebble pattern. Official match ball for both BUAFL & BAFCL National Leagues. Small pattern--easier to grip and throw with WIlson exclusive Grip Stripes. NCAA and NFHS approved. Perfect Training ball for all budding QB's. Build up your arm strength with this 2lbs in weight training ball. All-pros raise to the top. Rise to the top of your game with the NFL All Pro football. Sporting the official NFL logo and a durable, high-performance composite cover, this ball has all the features any fan could need. Using the same technology as the official sized Traditional Leather balls, the TDY offers the same advantages of the collegiate and high school balls in a pattern designed to enhance a youth game. The Traditional Series combines exclusive WE Leather, patented ACL Laces, Grip Stripes and unmatched multi-layed lining and 3-ply bladder technology. Wilson is the #1 name in football and offers the best selling game footballs in the country and are approved in all youth leagues. For a more affordable alternative to the traditional Wilson® game footballs, choose the Wilson® TDJ® Composite Junior Football. It features a premium composite leather cover, multi-layered lining and a butyl rubber bladder for maximum durability and air retention. The ACL™ laces are made of pebbled composite to offer a better grip than traditional laces. Play like a pro with Wilson® TDJ® Junior Football. You only rack up yards after the catch, if you make the catch. 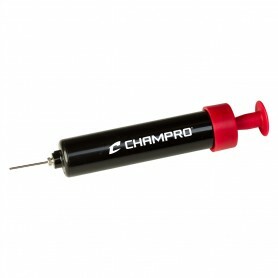 Give yourself and your team the best chance to go long by using our Tack Spray on your Wilson Footballs. A little bit helps bring out the tack, so you know your football will have the best grip every game day. The Wilson Pro Kick holds any size football to desired angle of tilt for kicking practice. The Pro Kick can be used with or without kicking tees and is collapsible for easy transport. Super Bowl LII will played at U.S. Bank Stadium in Minneapolis, MN on February 4, 2018. Even "The Duke" NFL game ball gets dressed up for Super Bowl. Bring home the only officially sanctioned fan version of the Super Bowl game ball today. This handmade in America leather football is as close as a fan can get to the official game ball that's made 51 straight Super Bowl appearances and counting. The words, "Commissioner," "Made in the USA" and "Wilson" have been the only words to appear on the NFL Super Bowl game ball since the games officially began. 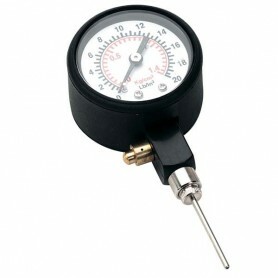 Football pressure gauge. Standard nedle attached. Patented ACL Laces, exclusive Wilson patterns and a durable composite leather cover combine to offer a more affordable alternative to our famous GST series of game footballs. Combining the same Wilson "TD" family of patterns with composite leather technology and patented ACL laces, the GST composite family is a great option for feel and control for practice, developing players, or inclement weather games. Wilson composite youth footballs feature a premium composite leather cover with high defenition pebble for superior grip. Patented ACL (Accurate Control Lacing(TM)) laces are made of pebbled composite leather which provides 174% more grip than traditional laces. 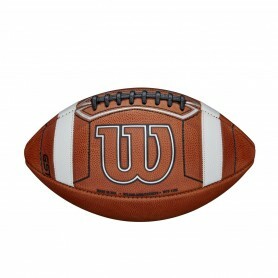 The stripes on the football are Wilson Grip Stripes and provide improved grip over traditional painted stripes. 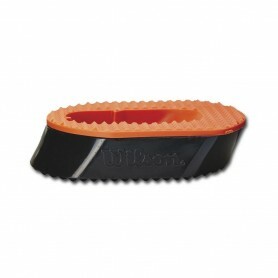 A multi-layered linig offers better shape and durability and the butyl rubber bladder provides maximum air retention. 14-16yrs. Wilson composite football, with all 32 NFL team logos and NFL shield on side panel. Blacked out laces. The Wilson Game Ball Prep Kit can help you restore the grip and tack properties of a leather football. It is ideal for coaches, quarterbacks and running backs. This set is designed to clean, wax and bring out the tack in your football. 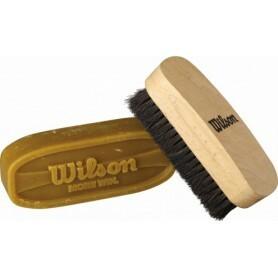 The Wilson football prep kit includes a wax bar and wood handle brush with soft bristles. 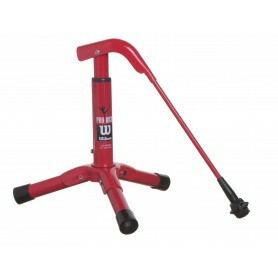 It will provide you with an improved grip to maximize your performance. Extend the life of your ball by using this Wilson football brush and wax bar kit. Even the iconic "The Duke" NFL game ball takes part in the pageantry on Super Bowl Sunday. This handmade leather football is as close as a fan can get to the official game ball that's taken the field in every Super Bowl to date. The words, "Commissioner," "Made in the USA" and "Wilson" have been the only ones to appear on the Super Bowl game ball since the games officially began. Bring home the only officially sanctioned fan version of the Super Bowl game ball today. Official NFL leather game ball from Wilson, with London Games 2017 logo. 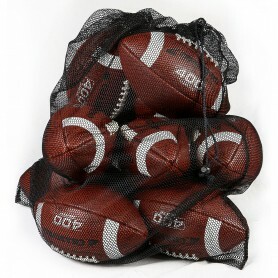 The Passback Composite Peewee Size Football (Ages 4 to 8) is the perfect football training aid for peewee football players just learning how to throw and catch a football. Never before has the game of football seen anything like the Passback™, the World's only football that rebounds and spirals back to the passer. Not only is the Passback™ amazing, it is simply the best tool for training, practice or play. The Passback™ is the only football you can throw and catch by yourself. No strings attached. Great fun or serious training Quarterbacks use the Passback™ to strengthen their throwing muscles and improve accuracy. The Passback™ gives receivers more than 20 repetitions per minute. Is inclement weather in the forecast for your next game? With the Wilson® Slick Training Football, you’re ready to tackle the elements. Designed to train you for games in the rain or snow, this officially sized football features a slick leather material ideal for simulating bad weather conditions. The collegiate-patterned ball also features sewn-on, half-white stripes and Wilson® and Slick Training logo details.